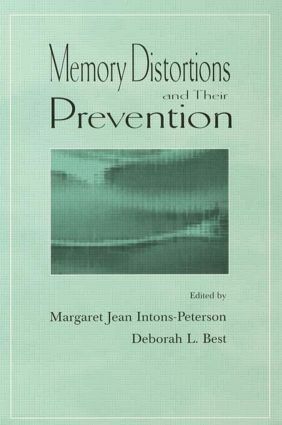 This volume explores the well-documented phenomena of memory distortion in a variety of settings, as well as how it can be ameliorated or prevented altogether. The editors have recruited some of the very best researchers in the applied cognitive field to address these issues. These authors examine distortion from several angles: fuzzy trace theory, face identification, memory deficits with age, collaborative influences on distortion, sociocultural influences on memory, retention of procedural and declarative information, and ignorance of medical and other information. The final chapter addresses the issue of cognitive technology, in general. Because of the surge of interest in applied cognitive psychology and in the memory distortion issue in particular, this book will be valuable to many applied and basic researchers. "Margaret Intons-Peterson should be designated the grande dame of short term memory by virtue of her pioneering work with Lloyd Peterson on techniques for its measurement." "The strength of the book lies in its breadth, and the mixing of theoretical questions with everyday, real-life applications." "…the writing is clear and the chapters should be easily accessible to undergraduate psychology students." Contents: D. Herrmann, M.J. Intons-Peterson, D.L. Best, Introduction and a Brief History of Memory Distortions and Their Prevention. V.F. Reyna, Fuzzy-Trace Theory and False Memory. M.A. Foley, H.J. Foley, A Study of Face Identification: Are People Looking "Beyond" Disguises? J.F. Hay, J.W. Nordlie, L.L. Jacoby, Assessing Memory Deficits in Elderly Adults: Repetition Errors, Misattributions, and Memory Slips. R.A. Dixon, L.M. Gagnon, C.B. Crow, Collaborative Memory Accuracy and Distortion: Performance and Beliefs. M. Gauvain, Sociocultural and Practical Influences on Spatial Memory. M.B. Jensen, A.F. Healy, Retention of Procedural and Declarative Information From the Colorado Drivers' Manual. M.H. Witte, A. Kerwin, C.L. Witte, Curriculum on Medical and Other Ignorance: Shifting Paradigms on Learning and Discovery. D. Herrmann, C. Yoder, Cognitive Technology.